But what does kid-friendly or family-friendly really mean? To help us answer this, we asked Terumi Pong of An Emerald City Life, who takes her two young boys all over Seattle. To Terumi and her family, "family-friendly means the whole family can have a good time, while kid-friendly sometimes means it's the littles having all the fun and us grown-ups are just barely hanging on to sanity trying to survive." Good thing Seattle has a variety of attractions for all people, big and small. We also asked Terumi her favorite family-friendly place to go in Seattle. 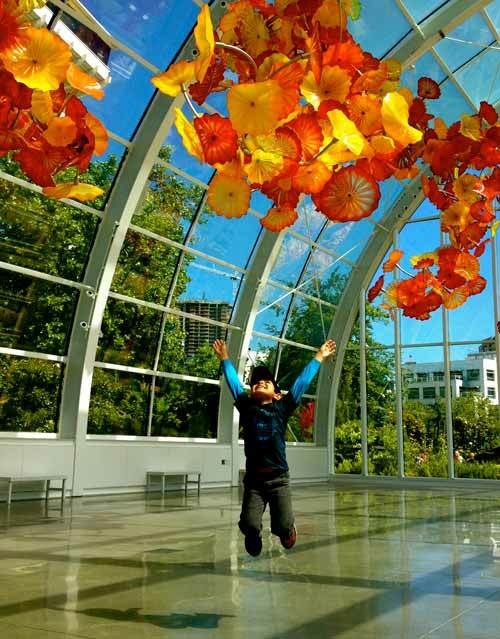 "We love Seattle Center because there's good food and lots of entertainment options for the whole family, like the Pacific Science Center and MoPOP. There's also good coffee from La Marzocco Café at KEXP, which is walking distance from an amazing playground. We also like the easy parking, shopping options, and that there's a good combination of indoor and outdoor spaces so we can get fresh air but can duck inside if it rains." 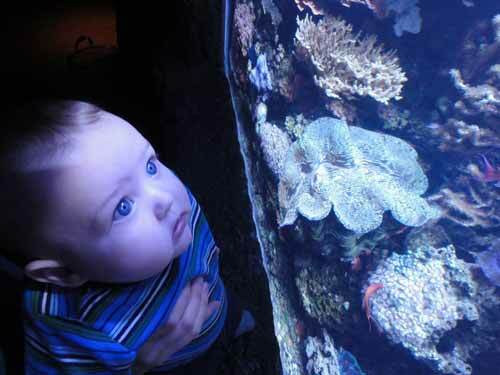 Check out the awesome things to do with kids at these locations and more below. You've got some exploring to do in Seattle! A trip to Seattle would be incomplete without a visit to the iconic Space Needle, where the whole family can enjoy stunning 360° views of the city from 520 feet up. As if the views aren't enough fodder for conversation, make sure to mention to little ones that the building is approximately 1,320 Milky Way candy bars tall. 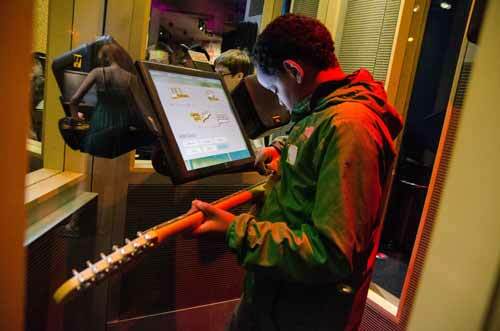 Kids will enjoy: Finding cool surprises in and around Space Needle on the interactive 4D Space Needle App. Parents will love: The awesome, contrasting views of the Emerald City and the natural beauty that surrounds it. The free photo experience on the outer deck also beats dressing everyone up for a stiff family photo. Where's the food? : The SkyCity restaurant, located in the needle at 500 feet, boasts a fresh menu inspired by regional cuisine, but the best part is that it rotates 360 degrees. You don't have to be a kid to think that's cool. The Seattle Aquarium seamlessly blends the fun of observing richly diverse marine life with hands-on education about conservation, making it the perfect place to bring budding young minds. Terumi takes her boys here frequently because it's easy to park, it's near food and shopping, and there are indoor and outdoor spaces. 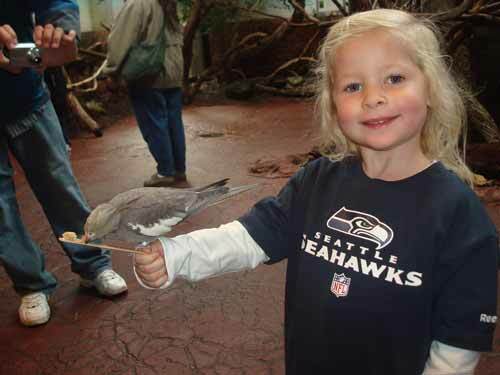 Kids will enjoy: Observing AND touching sea creatures in the sensory experience that is the "Life on the Edge" exhibit featuring animals native to Puget Sound. Parents will love: Watching life unfold in the Puget Sound from the massive Underwater Dome, especially at feeding time. The Family Activity Center, which provides an opportunity for parents to learn about orcas and how to protect them alongside their kiddos, is a must for families raising smart, empathetic little people. Where's the food? : The menu at the Aquarium Café is sure to please every member of the family with options ranging from pizza by the slice to sustainably sourced seafood entrees. 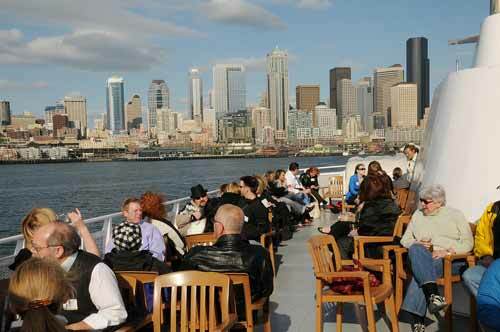 The cafe also serves up local microbrews, which can be enjoyed on the outdoor balcony facing Elliot Bay. Formerly known as the EMP Museum, the MoPOP is quite possibly the coolest museum around. The building itself, inspired by brightly hued electric guitars, is so, well, cool and the exhibitions dedicated to contemporary popular culture are as interesting and intellectual as they are flashy. The current, creative vibe at the MoPOP makes it a dream come true for families with older kids and teens. Older kids will enjoy: Walking around a museum that is more obviously relevant and engaging than the traditional museum. Events like 21 and under music competitions and exhibitions like "Indie Game Revolution" inspire kids and teens to conceptualize how they might make their own creative mark. Parents will love: Pop culture isn't just for the newest generation – creatives from all generations are featured in exhibits. Plus, the museum provides ample opportunities to discuss the ever-shifting culture with the kids, encouraging connections and understandings across generations. Where's the food? : The Culture Kitchen is a laid back, family friendly urban cafe and bar that serves modern comfort food. The faire is seasonal and local, and there's a $6 kids menu. The immersive exhibits at the Woodland Park Zoo give visitors the sense of being in the animals' habitats, helping them to understand how animals live and behave in the wild. Additional interactive exhibits and activities help families to connect with animals and their habitats with a focus on encouraging curiosity and conservation. This is another place Terumi takes her boys because parking is easy, it's near food and shopping, and there are indoor and outdoor spaces. Kids will enjoy: Seeing penguins, gorillas, wolves, and exotic birds up close. Also, playing at Zoomazium, the nature themed indoor play space. Parents will love: Interacting with care takers to understand the complexities involved in zoo upkeep and animal care. Plus, the wolves are strategically placed next to the elk, so you can see their natural predatory behaviors in play. Where's the food? : Carts and kiosks serving drinks and snacks are located throughout the zoo grounds, while the Rain Forest Food Pavilion and Pacific Blue Chowder House are available for heavier appetites and sit down meals. Chihuly Garden and Glass is a long-term exhibition featuring eight galleries, a glass house and a garden by fine art glass pioneer Dale Chihuly. The bright colors and unique shapes at Chihuly make it eye catching for little ones, and the larger-than-life structures and concepts are more than capable of capturing the interest of older children and adults. Kids will enjoy: Walking around the monumental garden, exploring the organic landscape and the massive and colorful glass house at its center. Parents will love: Learning about how Chihuly pushed the boundaries in the art world, including watching videos of his working process. It's worth staying to examine how the sculptures change as the sun moves in the sky. Where's the food? : The Collections Café is as colorful and detailed as the exhibits, with $5 bites and drink specials during happy hour. Check out the extensive collections of vintage objects selected by Chihuly. Whether you're a scientist or just starting to learn, the Pacific Science Center offers engaging interactive experiences at varying levels of scientific comprehension. The museum encourages curiosity and experimentation through entertaining exhibits meant to bring science to life for every age group. Kids will enjoy: Participating in hands-on activities and conversations with actual science professionals at Meet a Scientist. Parents will love: Learning more about contemporary issues in the scientific community. The Parents' Night Out also gives parents the opportunity to explore the town solo while kids are immersed in interactive lessons revolving around specific topics—double win! Where's the food? : The on-site Pacific Science Center Cafe offers a complete menu of lunch and dessert options. Splurge on the dessert; there's nothing like sharing all you've learned over a cookie. 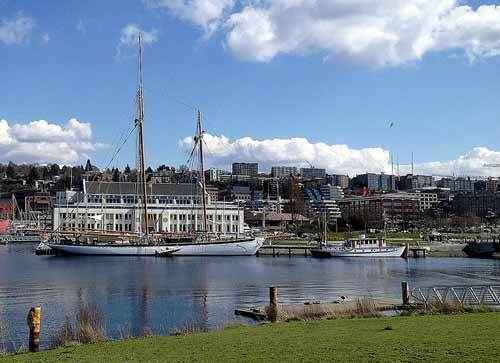 Called the quintessential Seattle cruise experience, Argosy Cruises' 1-hour narrated cruise is ideal for families looking to learn about the history of Seattle right on the historic waterfront. The fantastic views of the city skyline, Elliott Bay and the surrounding Olympic and Cascade Mountain ranges are made even better when taken in from the comfort of your seat on the cruise ship. Kids will enjoy: Trying to spot porpoises, harbor seals and sea lions from the open-air deck. 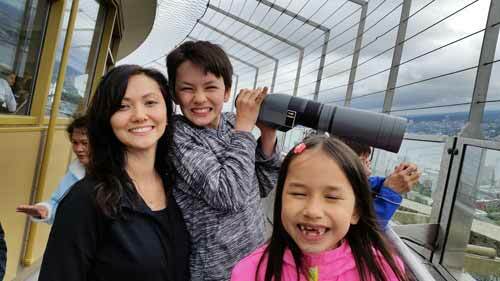 Parents will love: Exploring the workings of Seattle's diverse seaport up close and getting a totally different view of the Seattle skyline. Where's the food? : The full service bar onboard serves drinks and snacks, and the harbor is lined with great food options complete with waterfront views. 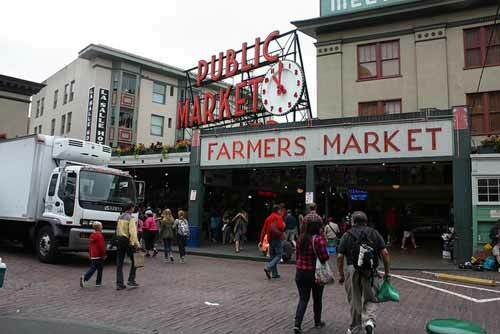 It's also a few blocks from the abundant food in Pike Place market. Pike Place Market is a huge public market overlooking Elliot Bay. Its central location makes it a great place to stop in for a quick bite in between other activities, but its interesting and diverse selection of food and merchandise makes it easy to spend the day here exploring. Kids will love: Watching vendors toss whole fish, sampling new and unusual foods, and checking out the different stalls. It might be fun to create a scavenger hunt for kids to complete here; winner gets a treat! Parents will love: Grazing their way through the market food stalls. The people watching isn't too bad, either. Where's the food? : Hah! Where isn't the food? 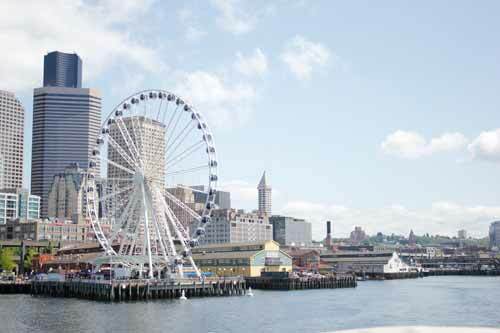 SLU is a trendy hub of progress and development located close to Seattle's downtown. The neighborhood is very walkable; public art, pocket parks and innovative businesses make it the ideal place for families to spend some time strolling together. Kids will enjoy: Stumbling upon unique events and activities, watching sea planes take off and land, and playing at Gas Works Park. 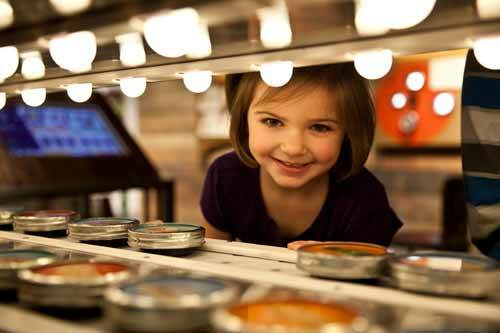 Parents will love: Shopping and eating in a playful, modern atmosphere. Where's the food? : Try Cactus for stellar Mexican or Li'l Woodies for a messy, delicious burger or Bar Harbor for cozy Maine-inspired cuisine. Simply put, there are a lot of options for good food. See the city from a totally different perspective on the iconic Great Wheel. The slow, smooth ride is appropriate for people of all ages (including babies and pregnant women). The sights and lights make the ride amazing at all hours of the day! Kids will enjoy: Advancing from the classic carnival ferris wheel to its much larger big brother. Parents will love: Pointing out all of the places the family has been (or will go) from the top of the wheel. Each ride is three full revolutions of the wheel, so you'll have multiple chances to see everything. Where's the food? : There are plenty of restaurant options at Miner's Landing at Pier 57. 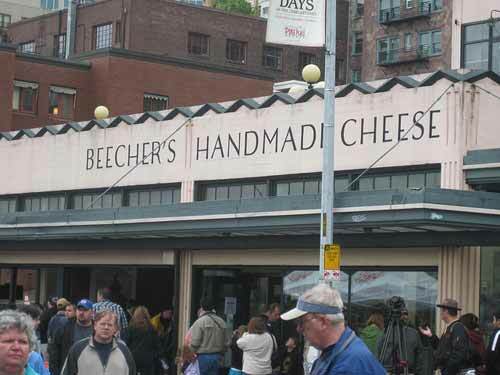 Located in Seattle's Pike Place Market, Beecher's invites guests to witness firsthand the centuries-old craftsmanship that goes into making their award-winning cheeses. Even better? They invite guests to eat that cheese. Lots and lots of that cheese. Yum. Kids will enjoy: Watching the cheesemakers do their thing over a steaming bowl of "World's Best" Mac & Cheese. Parents will love: The wide selection of American artisanal cheeses, all of which are made west of the Mississippi. Chowing down on curds and charcuterie is a great way to bond with the family and try as many cheeses as humanly possible at the same time. Introduce your kids to the indulgent experience of reading, smelling, and cradling a real tangible book at this full service multi-level book store. 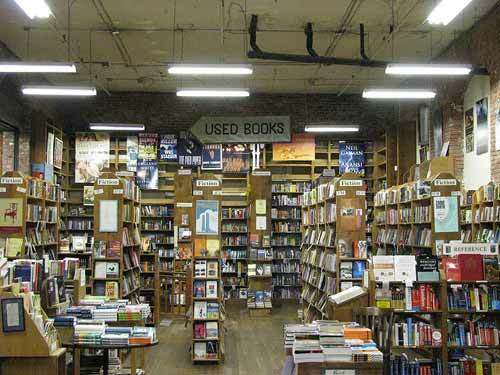 The Elliot Bay Book Company is at once uncommon and inviting, and its wide selection of new and bargain books is sure to please everyone. Kids will enjoy: Playing by the castle in the children's section. If you can swing getting to the castle by 11am on a Saturday, kids can enjoy a live reading of one of the many fine storybooks the EBBC has to offer. Parents will love: Perusing the aisles for faithful old favorites or exciting new reads. Liberally tossing around the phrase "back in my day…" is optional. Where's the food? : Grab a light lunch at on-site Little Oddfellows and go around the table reading a preview excerpt from each family member's books. Looking for more family-friendly food options? Terumi has an evolving list of restaurants her family loves. But their favorite is Tutta Bella, because "they have a great happy hour, their salads and pizza are delicious, and I love that they serve Bottega Italiana gelato, too!"